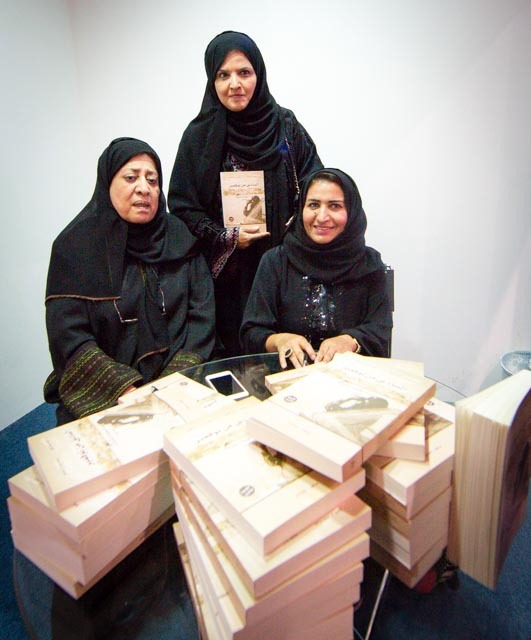 Today at the Riyadh Book Fair, Dr. Aisha Al Mana and Dr. Hissa Al Sheikh sat down to sign their book documenting the first demonstration to lift the ban on women driving on November 6th, 1990. Dr. Madiha Al Ajroush was there too with her camera and was kind enough to share the photos she took here. Dr. Al Ajroush had participated in the 1990 demonstration and is the only Saudi woman to take part in every single demonstration and movement to lift the ban on women driving since the first one. She’s also a renowned photographer who has at this year’s book fair an aisle named in her honor. I’m currently in the process of translating the Sixth of November book. Scroll down to read a sample of the book in English. Dr. Madiha Al Ajroush under the sign for the aisle named in her honor. 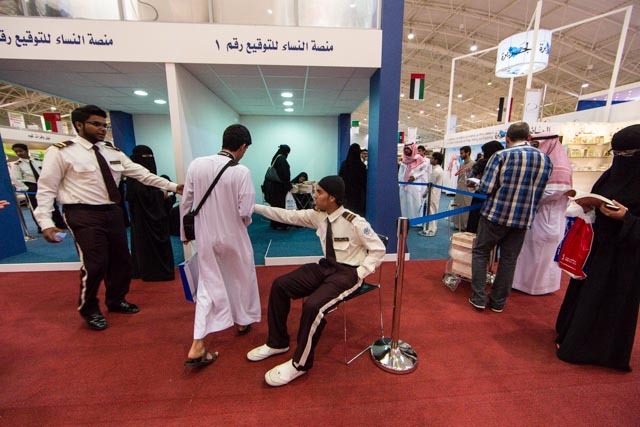 Security guards make sure that book signings are gender segregated. A view of the crowd lining up to say hello and get their books signed. At around 2:30 in the afternoon of November 6th 1990, a good crowd of women started showing up at the parking lot of the Safeway supermarket. Some were driven there by their drivers and others were driven their by their husbands or sons. Once at the parking lot, the chauffeurs, husbands and sons relinquished the cars to the women. The number of women outnumbered the number of cars available. There were forty-seven women and fourteen cars taking part in the demonstration. Not all of the women knew each other and some had never met before that fateful day. Every woman with a valid driving license obtained from abroad assumed the driver’s seat in each car while the other women got in the passenger’s seats for support. As the prayer call for the afternoon prayer began, the women started their cars. Their husbands, sons and drivers stood in the parking lot, in silence, watching. The simplicity and justice of the movement lent it a reverence that enabled the women to trust in each other and have the courage to act together in their shared cause. The women started driving their cars one after the other. At the head of the demonstration was a car driven by Wafa Al Muneef followed by another driven by Dr. Aisha Al-Mana. They started on King Abdulaziz street and went on to Ouroba street and then took a left onto Thalatheen Street. The stop lights slowed some of them down. The cars at the beginning of the movement would every once in awhile slow down so that the cars behind could catch up, as they had decided that they would stay together. The scene drew spectators both pedestrians and other car drivers. They stood in shock and disbelief but did not interfere with the procession. Emboldened by the fact that the police had not stopped them or paid them any attention, the women at the head of the demonstration decided to drive another round. It was at the beginning of the second round that the police finally intervened and stopped the women. The police stopped the women’s cars one by one in a line against the pavement in front of The Riyadh Palace Function Hall on King Abdul Aziz street. The presence of members of the Commission for the Promotion of Virtue and Prevention of Vice (Religious Police) shortly followed the appearance of the police. The first thing the policemen did after stopping the demonstration was to ask the women to produce their driving licenses. One woman quickly handed over a valid driving license she had obtained from the U.S.A. Faced with this awkward situation, the perturbed policemen called for their superior who arrived just as the members of the Commission for the Promotion of Virtue and Prevention of Vice did. The Commission members requested that the police entrust the women and the investigation over to the Commission. The women opposed the idea completely and the police refused as well. When do you hope to have completed the translation of the book? And would it be available for purchase outside of Saudi Arabia? God bless you ladies for your courage. May these events serve as a wedge to force a widening of our sisters’ freedom. Segregated queuing? Wow, things are way more stricter than I thought. Very interesting read! Could you please let me know your plans for publishing the book in English. I am very interested in the subject. If the Movement to establish Women`s Rights in Saudi Arabia does not include manifest for General Social equity, the effort will have no more ethic than Legal Marijuana. Towards a United Islamic Socialist Workers Party of Saudi Arabia ! These protests contradict what the Sharee’ah has commanded and what it has prohibited regarding the way in which individuals should interact with the rulers in the face of evil acts, munkaraat(acts of disobedience), oppression, inequity, or their misappropriation of the wealth and keeping it from the people. The books you are writing are the wings that will fly you over all the obstacles facing you, keep up the good work. I’m so happy to hear that you are translating their book! I’m reposting this over on http://www.saudiwomendriving.blogspot.com Best of luck to all! The women drove, and other women accompanied them in passengers’ seats, no? What I don’t understand is why their men did not sit in the passengers’ seats. They obviously supported their women, but not all the way? They knew the police and mutawah would be involved. Should they not have defended their women? Hello! I am a woman from Sweden, who applause the courage of the women of Saudi. Truly, you are fighting a struggle which concerns women from all over the world, which was made clear to me after reading a terrifying article I found on the net. I have long been an admirer of your blog. This article claim that Women from Europe (also my own country Sweden) are kidnapped to Saudi Arabia, were they are placed in harems and never heard of again: [http://ampbreiareloaded.com/female_circumsions_and_sexual_slavery_in_saudi_arabia.htm] I realize that this can simply be waved of as some sort of islamophobia, and I assume there are no confirmation. However, would this be impossible? As for myself, I do not know the truthfulness of the story, but: thinking of the reason to why this would ”’not”’ be possible, does it not sound more naive than the opposite? I do not know, but how much insight is there to the “harems” mentioned in the article, and how realistic is there that a woman taken there would simply be counted as a disappearance in her home country? If it does indeed happen, is there a reason to why this would be discovered at all? It it realistic that this can actually take place practically? I realized that it is impossible to know the truth, but perhaps this is a subject worth mentioning in your blog someday? Could there really be western women imprisoned in the royal harems in Saudi? It made me terrified when I read about it. My best regards. 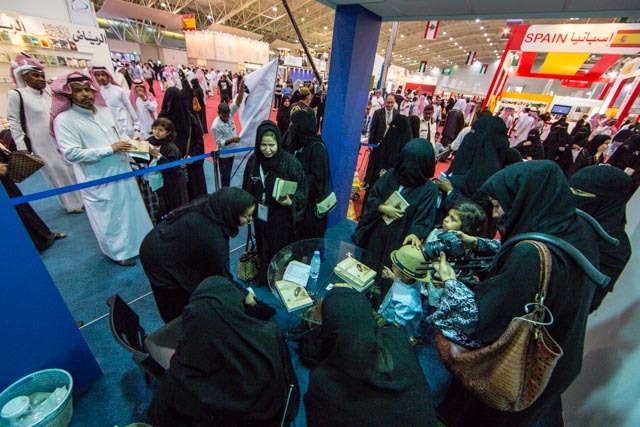 When is the book fair coming back to alriyadh ? Hello Aisha Knew you would accomplish great things since last I called you from Japan, when you were under house arrest for your driving protest. I think those listening to us were afraid of my threat to call the N.Y. Times about you and your being jailed. Hardly recognized you in Bihar, but saw your photo on the Forbes website. I will be 70 soon and intend to devote the rest of my life as you have, in promoting and protecting women’s and girl’s rights. Please contact me by email and we can go from there. I live with Martin and our four PARROTS in. Louisiana. I so admire you and cherish the memories of my working with you in your school in Riyadh.